dotepub provides a bookmarklet which allows you to convert any webpage into an ebook with just a single click. Once saved, you can read that ebook in any of epub compatible devices like e-readers, smartphones, desktop computers. It’s good for downloading long articles as reading those on web isn’t always a preferable option for many. Now whenever you want to download any webpage as ebook, simply click the dotepub bookmarklet and that webpage will be automatically converted into ebook format and downloaded. This option doesn’t save any images or links in the original webpage. It is case when Immersive mode is On (Default Setting). If you want to download the webpages with images and links then you need to make a slight change to the settings. 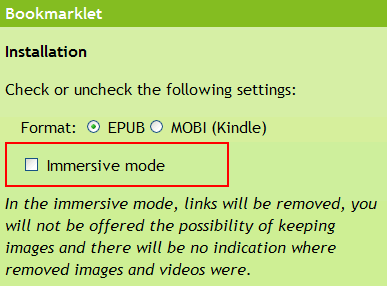 Firstly Go to dotepub.com website and then go to bookmarklet section and uncheck Immersive Mode as shown below. Go ahead and simply drag the dotepub icon from the website to your bookmarks and it’s done. Now whenever you click the button, currently selected webpage will be converted to ebook format with images and links in it. As you may have noticed in screenshot in Option 2 above, that there is an option to choose between EPUB and MOBI format. You can select MOBI format, if you plan to read the webpage on your Kindle. If don’t want to use the bookmarklet, you can also install the extensions for Firefox and Chrome. Now you can read that downloaded ebook by either using Calibre, or on your smartphone, iPad, Kindle etc.